Buzz Aldrin wants to see the public get excited about space exploration again. It’s critical, actually, if the Apollo astronaut is to accomplish his goal of a permanent human settlement on Mars in the next two decades or so. 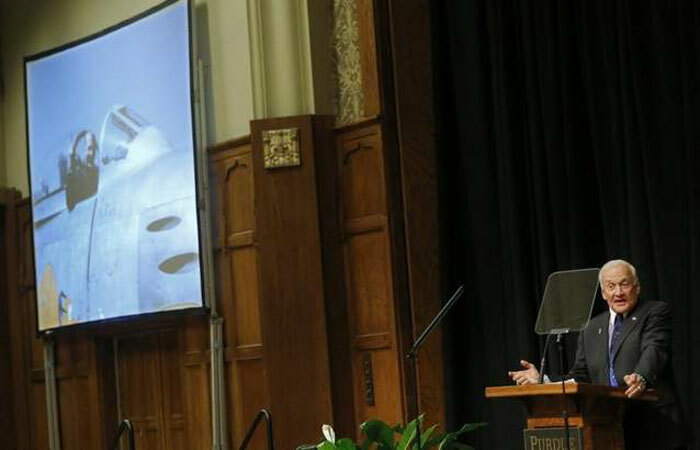 The recent success of the movie blockbuster “Gravity” is a good start, Aldrin told a packed house Wednesday at Purdue University’s Memorial Union Ballroom, which was filled with students, faculty, staff and the public who wanted a glimpse into Aldrin’s vision for the future of space exploration. Aldrin said he’s not encouraged by what he described as a shortsighted political environment and lack of a unified purpose in Washington, D.C., being able to turn his Mars vision into reality. During his talk, called “Buzz Aldrin’s Unified Space Vision,” Aldrin said a new pool of talent trained in STEM fields — or science, technology, engineering and math — will be critical for the U.S. to achieve before it becomes cutting-edge in space exploration again. While Aldrin answered questions from the audience after his prepared remarks, a crowd was forming outside the ballroom as more than 100 people held copies of Aldrin’s book “Mission to Mars,” hoping to get them signed. Among those waiting was Fouad Khoury, a first-year aerospace engineering and physics student who said he was inspired by Aldrin’s words of encouragement about the importance of hard work and a personal sense of adventure. The message of collaboration was consistent throughout Aldrin’s talk as the astronaut talked about political and international partnerships and shared visions as being pivotal to humans’ success in space. “I worry we’re caught in what could be an unproductive race to the moon,” Aldrin said. “Let’s focus on cooperation with our international partners. Don’t race with them. Aldrin said a few calculated risks couldn’t hurt either.